Open up the spammy message by double-clicking on it. Under the 'Message' Tab, you will find the 'Tags' section. Click on the arrow to bring up the 'Properties' box. You will find the 'Internet Headers' in the 'Properties' box. Once you find the 'Internet Headers', put your mouse in the box and right click. Choose to 'Select All' and the information will become highlighted. Once it's highlighted, right click again and choose 'Copy'. Once it's copied, click 'Close'. Now, 'Close' out of the message, too. Now, you will be back at your Outlook client. Highlight the spammy message again and click 'Forward' so that you can send the email WITH the headers to your web host or ISP. 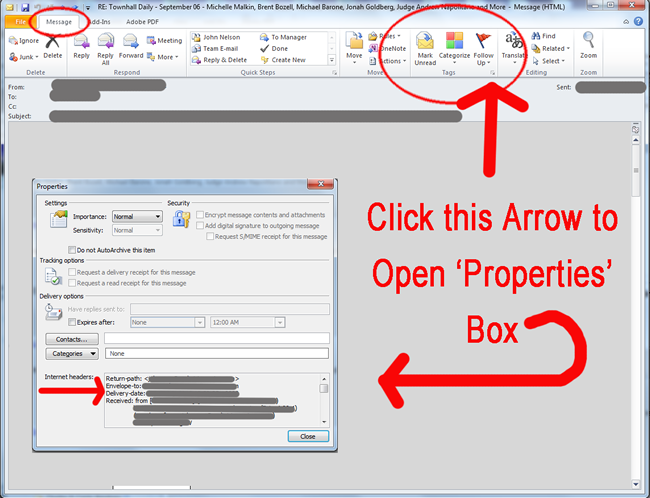 Once the email opens up for you to edit it, click in the text area at the very top of your email and 'Paste' the header information that you just copied from the box. Address your email to your web host or internet service provider and 'Send'. Congratulations ... You have just learned how to send the headers of your Outlook 2010 email spam to your web host and internet service provider!